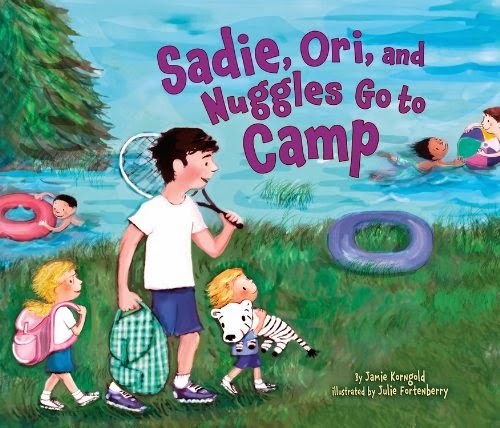 Kirkus just reviewed Rabbi Jamie Korngold's forthcoming book, "Sadie, Ori, and Nuggles Go to Camp." It's illustrated by Julie Fortenberry. Experienced camper and older sister Sadie helps younger brother Ori get ready for his first year at sleep-away camp. Sadie loves summer camp, a place where she feels at home with her Jewish friends, acting in plays, playing sports, singing around the campfire and enjoying ice cream sundaes. Seven-year-old Ori will attend this year and, while packing, becomes concerned about taking Nuggles, the favorite stuffed animal he has slept with since birth. Though Sadie assures him that bringing Nuggles will be OK, Ori worries that “the kids will think I’m a baby.” After a trial night at home without Nuggles, Ori cannot sleep and decides to pack the stuffed zebra. Trepidation turns to a welcome surprise when he arrives at camp and sees his bunkmates, each cuddling or sitting with his own beloved “stuffy.” Korngold’s talent for taking stressful childhood moments and developing them into simple yet satisfying storylines continues to be in evidence in this fifth installment of her Sadie and Ori series. Though briefly alluding to the Jewish camping experience through one double-page spread highlighting a Shabbat candle lighting and the occasional yarmulke, this should serve most new and first-time campers well in providing a positive response to the anxiety that inevitably accompanies excitement at leaving home. Gentle, loosely defined paintings depict a middle-class home and woodsy camp. I love adventure from my childhood.thank you very much for the information provided.When you buy anything you do not know how to buy at a lower price.we can solve this problem.Please click here tv price tracker tool .